Hot yoga strengthens and tones muscles. Bikram yoga, also called hot yoga, involves practicing in a room with elevated temperatures and high humidity. 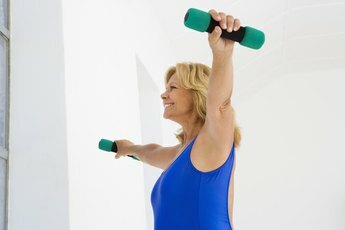 Despite its many benefits, yoga can contribute to shoulder pain for some women. If you're new to Bikram yoga, you may be experiencing delayed onset muscle soreness, but you could also have sustained an injury. If your shoulders don't respond to treatment or the pain worsens, contact your doctor to rule out a more serious problem. The high heat used during a Bikram yoga session might make your muscles more flexible, but this increased flexibility can also increase the risk of straining or spraining your shoulders. If you consistently do the same poses during hot yoga, you might be overusing your shoulder muscles, which can cause pain in the area. After starting Bikram yoga you might feel muscle soreness in the hours following your first few sessions. Each condition is treatable and shouldn't stop you from continuing with yoga as long as your doctor approves. Before starting a Bikram session, stretch your shoulder muscles. This helps warm them up and might help reduce muscle soreness when you're done. If you sustain an injury during yoga, taking a break from the studio is important for allowing your shoulders to recover. Once you return to your routine, "Yoga Journal" suggests paying close attention to your form during each pose to ensure that your shoulders aren't being pulled or constricted to the point of injury. Mix up the shoulder poses you choose to prevent overuse issues. The appropriate treatment for shoulder pain caused by Bikram yoga depends on the nature of the pain. Muscle soreness generally responds well to rest, compression and over-the-counter pain medications. Apply ice for 10 to 15 minutes several times a day as well. If you've injured your shoulder, see a doctor for a specific treatment plan, which might include a week or two off, pain medications and even surgery, depending on the severity of the injury. You know to head to your doctor if your pain gets worse or doesn't go away with treatment. However, if the pain recurs when you head back to the studio or is severe with minor movements, you need to see your physician. If your shoulder pain is accompanied by a fever, rash, dizziness, weakness or trouble breathing, get medical attention right away. If pain occurs during a Bikram session, stop and contact your doctor. Vanderbilt University: Bikram Yoga: What's it All About?